One of my most favorite Persian drinks is Sharbateh Albaloo. It is the most delicious and refreshing juice ever. I have very fond memories of being in Iran and drinking it during hot summer days. This drink is always offered to guests when they come for a visit along with other options such as tea and water. I love albaloo, what here we commonly know as sour cherries. We used to have a small tree of sour cherries in my grandmother’s backyard. This was yet another fruit to look forward to in the early summer. I used to pick fresh ones from the tree all the time. Good old days! It has been years since I have had fresh ones. I personally like to drink mine very very very cold. So I not only use ice, but also cold water out of the fridge. First place ice in the glass and then add the syrup. It is up to you how much syrup to put in, depending on how sweet you like your drink. I don’t like mine too sweet so I find that the amount shown in the picture is perfect for me. Nevertheless, it is best to keep the ratio to more water than syrup. Give it a nice stir and watch as the color changes into a dramatic and gorgeous ruby. Yes, this is sooooo good. My mom’s trick is to add carbonated water. Love this. My family also added carbonated water. It’s delicious. Another summertime favorite of mine is secanjebin. I have never had it with carbonated water. I love sekanjebin as well. So good! It probably is very similar. Did you you like it? I recently discovered that there are sour cherry orchards just north of LA. I am so going next year to pick them! 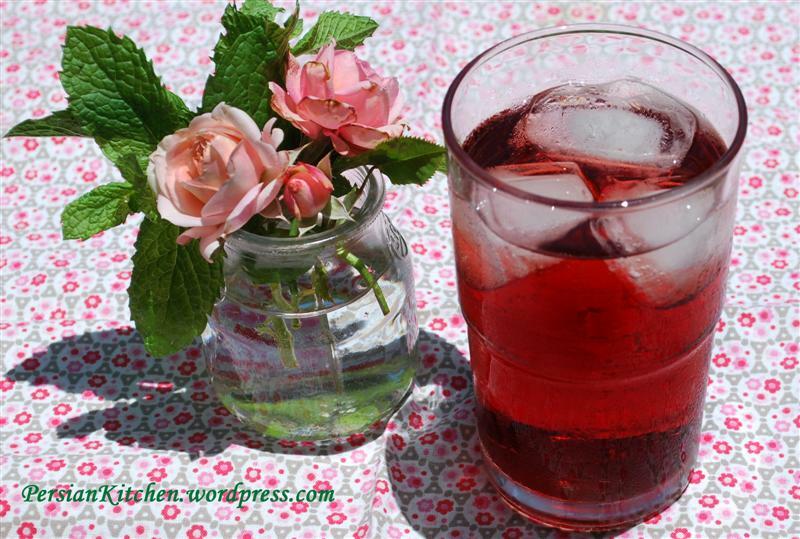 in my region, in the northern of Italy, there is an old recipe for preparing a refreshing drink using the leaves of sour cherries and it comes out of ruby color as well. There is also here a sour cherry syrup sold at the stores, i wonder if it tastes more or less the same as the middle eastern ones. The drink that you wrote about sounds good and would love to try it. Chances are that the syrup is very similar. I didn’t know there were sour cherries in Italy. Ha! Is this sour cherry the same as (I am sure I cannot spell this right– I am going by sound) zareshk? If not, of please tell me what zareshk would be in English. You see, years ago I had a good friend who lived in the Persian community of Madrid and their family used to make a chicken dish using these zareshk berries/cherries. They were small and red and had a very distinctive stem and a very satisfying favor. I am trying to find them. Can you help? Sour Cherries, albaloo, and Zereshk are completely different. Zereshk in English is Barberries. While they are both tart, sour cherries are slightly smaller than cherries. Barberries on the other hand are very small, smaller than cranberries. They are both delicious and you can actually make rice with both. When I was little my favorite rice was zereshk polow. Check back in this week as I made albaloo polow last week and will be posting it this week. And Zereshk polow will make an appearance soon as well. Thank you! And thank you for getting back to me so fast. Gosh, I had that meal back in 1986, and I still remember it today– which only goes to show how good Persian cooking is! You site has brought back some great memories for me. I looked up the barberries and that is indeed the one I remember. I think they are going to be hard to find and that I will have to get them online. Now I can! I will try to do your rice when you post the recipe. Lisa, 1986? Seriously??? That’s 26 years ago! That’s seriously impressive that you remembered the name of it! I am so glad you enjoy Persian food. It is good stuff indeed! Here is a link to purchase them online. I have never bought Persian food online, but this is my favorite brand when shopping at Persian stores. Seriously. I know that was the last time I ate them because that is the year I left Spain. Thanks for the link! Imagine craving those barberries for 26 years and not being able to find them because you kept messing up the vowel I will be ordering some today.